Finally, Kraftwurx has a DMCA (Digital Millennium Copyright Act) notice here –http://www.kraftwurx.com/copyright-a-intellectual-property. 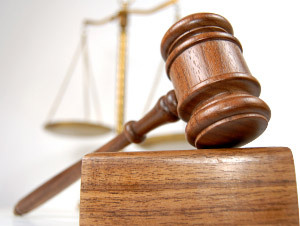 Note that the DMCA, or safe harbors, would also apply to 3DPrinting service providers. In April 2012 Trimble purchased the SketchUp business from Google – including the 3D Warehouse – along with a curious allocation of rights to content that had already been submitted (with a closing that apparently happened on or about June 1st, 2012). See: http://www.sketchup.com/intl/en/usernotice.html. Continuing use and access to the 3D Warehouse will now be governed by Trimble’s terms, a preliminary set of which were linked through in the “User Notice” referenced above. However, the link resolves to an old set of Google 3D Warehouse terms (which are unchanged), see: http://www.sketchup.com/intl/en/3dwh/preview_tos.html. 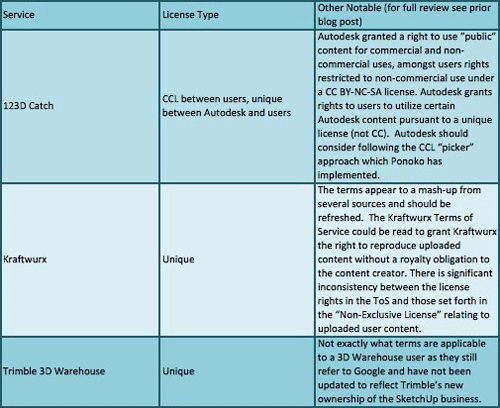 Ponoko has clearly thought through the implications of IP on the capture or create/modify/make ecosystem with a very clear and explicit licensing scheme. Section 4 of their terms of service still provides that uploaded content may still only be used for “non-commercial” purposes – obviously a significant limitation if the user/contributor is looking to use or submit content as part of a commercial or fee-paying project. To be able to become a contributor, a user must become a “Cubify Artist,” see: http://cubify.com/learn/faq.aspx#CubifyArtist. See previous article on Thingiverse TOS changes.